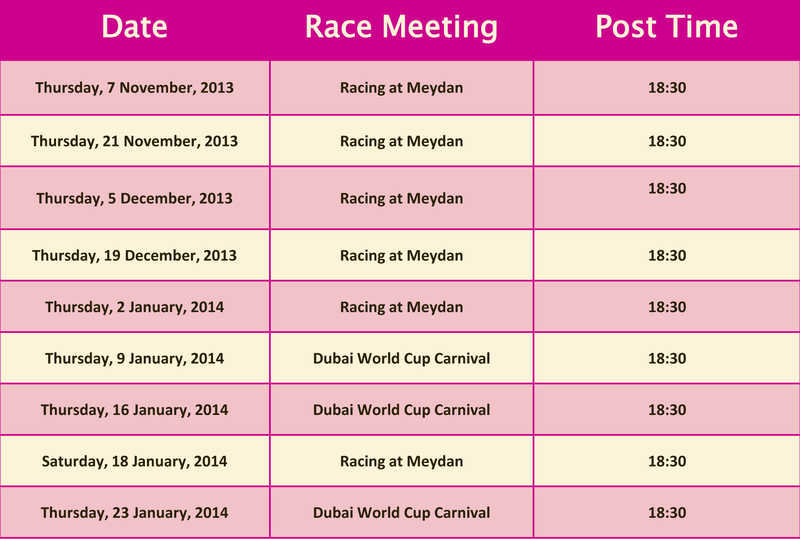 The season for our Dubai DMC has already begun November 7, 2013 with “Racing at Meydan” a showcase of nine race meetings spread over the months of November through March. 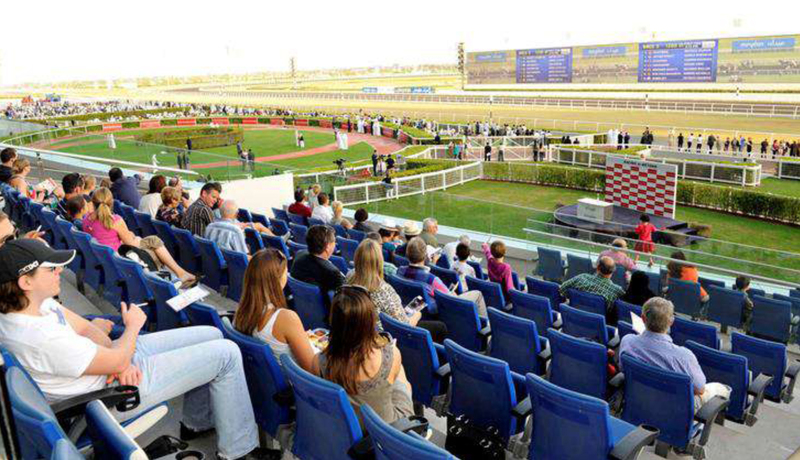 The race meetings are designed to promote the rising talent of the UAE and the region and the racing is regarded as a stepping stone into the premier league – the prestigious Dubai World Cup Carnival (DWCC) a total of 11 meetings that will get underway on January 9, 2014 and conclude with the Dubai World Cup, scheduled for Saturday, March 29. The Premium seating area is situated opposite the finish line, offering stunning views of the house. Guests can soak up the electric atmosphere in the alfresco area from the comfort of their seats. Food and beverages are readily available for sale from the food and beverage kiosks strategically placed at the entrance to the Premium Seating area. Guests can enjoy light snacks from the comfort of their seats without missing the horseracing action. The food and beverage kiosks will be open half an hour before each race. *Minimum age is 5 years old. All children of the age 5 years and above require a ticket to enter. There is no child special rate for Premium Seating. This Lounge area spanning two levels on the Mezzanine and Ground Floor is adjacent to the Parade Ring. Enjoy privileged close-up views of the horses in the Parade Ring, or get close to the racing action. Guests can also watch the racing from the flat screen TV’s whilst sipping on their favourite beverages or enjoying some traditional pub style food from the a la carte menu. Badges for this area only grant access. No reservations for tables will be made. Entry for 21 years of age and above only (proof of identity is required). The Lounge will be open half an hour before the first race. This modern take on an international buffet, offers a stylish array of gourmet delights, encouraging all guests to savor as many of the delightful flavours on offer throughout the night. With floor to ceiling windows, the restaurant offers beautiful elevated views of the horseracing, proving the perfect choice for racing enthusiasts. Whilst socializing with friends, family or work colleagues, guests can also enjoy the races from the attached outdoor balcony. The buffet will be served for four hours. 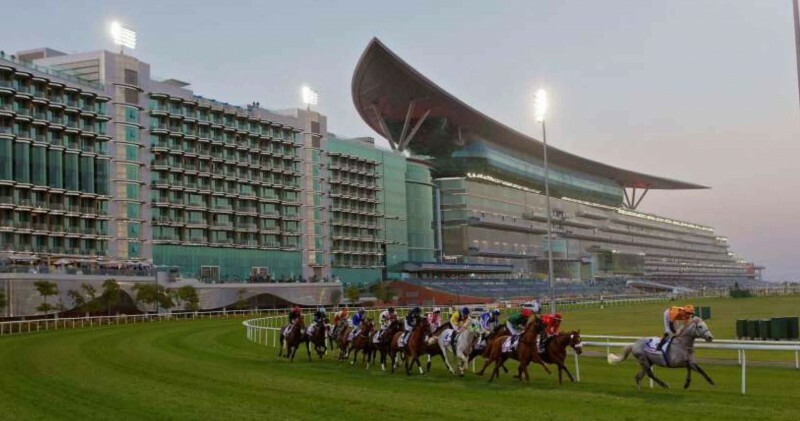 Featuring a glass fronted dining area, Meydan Grandstand’s signature restaurant, spans across Level 2 and 3, and is perfectly positioned to allow each table of the 4 tiers amazing views of the Meydan Racecourse and winners circle whilst enjoying the set menu. Impeccable service and uncompromised dedication from the service team completes your dining experience. The package will be served for four hours. *Minimum age is 5 years old. All children of the age 5 years and above require a ticket to enter. There is no child special rate for Tiered Restaurant. Private Grandstand Suite entertainment is a great way to impress clients, friends or reward employees. Make your event one that stands out – join us at the races for an evening of great food and entertainment, and give your guests a night they will cherish! Dedicated service staff will cater to you and your guests throughout the evening with an array of food served from your private International Buffet station. Soft drinks and standard house beverages can be inclusive in the package and are served from the purpose designed bar area within the suite. All suites are interconnected and can be joined to facilitate larger groups or to give additional space for exclusive gatherings. At the suites, you can watch the races whilst being in the company of family, friends or work colleagues. The package will be served for four hours. *With our Dubai DMC office please note that all catering must be provided by the official caterer: Meydan Hotels and Hospitality. Upgrade your suite package to a five hour package for USD 31per person. 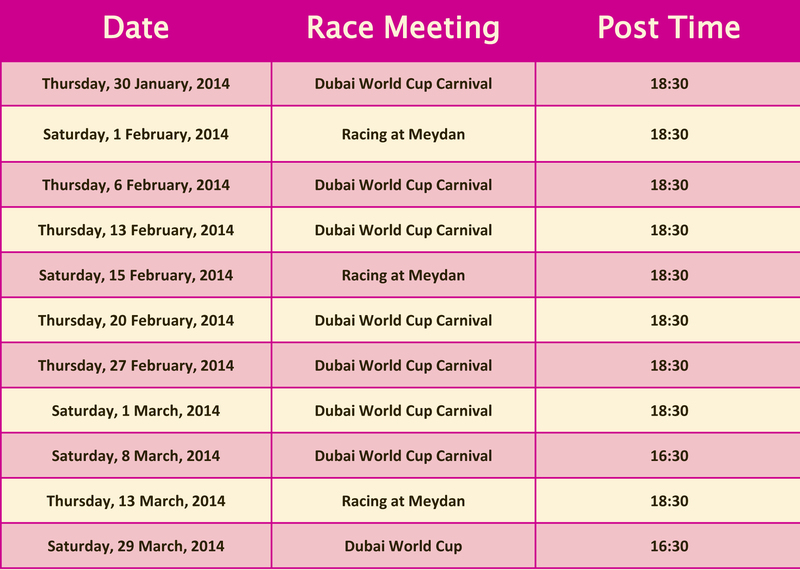 Would you like to receive more information about the the race meetings, availability and new events? Contact us and we will be happy to put you in touch with our Dubai DMC.